In his 14 points, by saying “Eliminate management by objective. Eliminate management by numbers and numerical goals,” Deming directly attacks Peter Drucker, the most revered guru of American management and creator of Management-By-Objectives (MBO). By the time Deming contradicted him, Drucker was an American institution, as sacred as the constitution. Drucker has published a new book every two to three years from 1939 to 2005 and contributed more than 30 articles to the Harvard Business Review. He received numerous awards from several governments, including the US Presidential Medal of Freedom, and has streets and a business school named after him. In the Lean world, MBO has been replaced by Hoshin Planning, which is subtly but radically different. Drucker’s influence in the US remains so strong, however, that my favorite book on Hoshin Planning, Pascal Dennis’s Getting the Right Things Done, actually pays homage to him. The title itself is Drucker’s definition of effectiveness and, inside, Dennis presents Hoshin Planning as a refinement of MBO. It is still easier today to get through to an audience of American managers by standing on Drucker’s shoulders than by debunking him. But Deming was in his eighties when he wrote his 14 points, his success in Japan had finally given him an audience in the US, and he must have known that he was running out of time to make his points. He thought MBO was a bad idea and he would not pussyfoot. 15 years later, Drucker himself came around to the same point of view and recognized that MBO had failed. What did Deming find wrong with it? In The Practice of Management (1954), Drucker repeatedly asserts that it is essential for managers to have quantitative objectives to work towards. They should set these objectives themselves, consistent with the objectives of the business as a whole. But Drucker is short on how this could actually be done, how you identify proper metrics, how you set targets for each metric, and how you go about reaching these targets. It is not an accidental omission. In Drucker’s world, managers can find the answers themselves. It is part of their job, and they are supposed to have the requisite talents. Instead, Deming sees arbitrary objectives, unrelated to the purpose of the business, set without any plan on how to achieve them or even a means of taking accurate measurements. Deming sees MBO as “an attempt to manage without knowledge of what to do.” The managers focus on outcomes without looking into the processes that produce them. They end up gaming metrics rather than improving processes, and playing management whack-a-mole. About managing by numbers, Deming notes that performance evaluations of groups or individuals fail to differentiate between fluctuations and outliers. Whether you measure quantities produced or units sold, there will always be a ranking, but top performance only indicates a difference in effort or talent if it is high enough to be an outlier. Otherwise, it would be just as meaningful to rank people based on the number of heads in 50 coin tosses. Deming makes the case that fluctuations should never be the basis for management decisions. If you sell a product through three dealers of equal talent and resources, with territories of equal sales potential, you will still observe differences in results that will enable you to rank the dealers, even though these differences are just the luck of the draw for this particular period. What Deming does not go into is what happens when you repeat this kind of ranking over a sequence of periods. If the first period was a fair competition, the following are not, as the top performing dealer starts receiving preferential treatment, such as an award to post in the show room, priority access to new products and marketing materials, and special training in sales or customer support. All of these advantages make it more likely that the ranking will be the same in the next period, with a larger gap. Revisiting Pareto shows how iterations of a pure game of luck can lead to the top 20% of the players holding 80% of the chips when the outcome of each round determines the probabilities of success in the next round. If one of the dealers sold not 5% more but three times as much as the other two, it would be difficult to explain it away as a fluctuation or a fluke. It would be most likely due to the use of a different and more effective approach, which would warrant special treatment. What is perhaps most remarkable about the story of MBO is that its poor performance has made no dent in Drucker’s reputation as a business thinker, and that many companies continue to use it. A great post Michel. Pretty much parallels much of our thought on metrics. I suspect MBO is still popular because it is easy to do. Divide up the parts, give everyone a goal and have them go for it. It is also much easier to see performance of a piece, rather performance of the whole. The ‘whole’ gets done by many functional departments. In the case of a manufacturing company that might include: sales, engineering, customer service, manufacturing and delivery. There is an unspoken belief that if all of the parts get maximized, somehow the overall process will be optimized. Of course in the real world it does not work that way. The parts need to operate in harmony across the functions in order to maximize the overall process. But then the challenge is…”Who gets credit?” Since we are typically not set up to manage from a process perspective. No one knows, thus we somehow keep drifting back to managing the parts and believing that will optimize the whole. Deming stated over the years that somewhere between 85% and 95% of all performance problems in an enterprise are process problems, not people problems. He is defining the word “Process” with a capital P. Leadership owns the processes that cause work to get done. Let’s just consider your example of ‘metrics.’ If the metric process is focused on optimizing the various component parts, an individual would be swimming against the tide if they tried to focus on the overall process, rather than their piece of the process. Thus most businesses in North America and Europe operate with this narrow view of the world. Having said that it is still so much easier to go find a guilty party and hang-em! There are many quaint sayings that support this thought one being “don’t hang the messenger.” Yet organizations still do follow that practice. Until leaders realize they need to manage more (not solely) from a process perspective, the conundrum you describe is not likely to change. This seems like a Distinction without a difference, Michel. In both cases, metrics are used to track the success/efficacy of the outcomes with the distinction being that in MBO, the metrics are devised by; “Drucker repeatedly asserts that it is essential for managers to have quantitative objectives to work towards. They should set these objectives themselves, consistent with the objectives of the business as a whole.”, while in parallel, Hoshin Planning, the metrics and objectives are organizational policy decisions, (top-down), which are then disseminated to all in the organization so that they can align their individual metrics/objectives to that policy. One might argue that culturally, the first, MBO, would be more “democratic” and culturally aligned with the organic US management methods whereas the second, more aligned with where Deming had his great success, Japan, a more structured and more easily aligned organizational paradigm. The wrong objectives and metrics can only be devised/implemented by unprepared and uncreative “leaders”, holding management positions, which may be the real crisis, in our Management Methods, that should be studied…… 🙂 and to which, both approaches are very vulnerable. Product designers translated this into the Prius; HR into an open-house to explain to the community how Toyota treated its people. The strategic issue was defusing the foreignness of the company, but the Hoshin itself was almost like a zen koan. Michel. All strategic operations have metrics. “Beloved company.” sounds like the name of a military/propaganda operation…. 🙂 …. but, the point is that they identified the “foreignness of the company” as a problem so they enacted policies to address that, namely making a, (revenue insignificant) hybrid car which resonated with the US consumers’ ill conceptions of “Green” and hoping to affect the image of the company, and launched a PR campaign regarding its workforce policies etc., which must have likewise suffered at the time. All fine…. but what does any of that have to do with the quality, performance of their products? The metric is, did they achieve their goal of reducing the company’s foreignness? I think not, while, more recently, a relatively “routine crisis” with an accelerator pedal, exposed a management rigidity that allowed it to greatly undermine the company’s prestige…. not that an MBO approach would have led to different results if the players were the same. All well-reasoned propositions. What’s easy to do will always be more popular than that which takes greater effort. And perhaps this is really a difference without distinction. But I guess I’m most curious about the “who calls the shots” question, which may be the more challenging issue. “Someone” needs to clearly define and articulate the purpose of the organization. “Someone” must lay out concrete and very specific objectives which must be attained if that purpose is to be met. “Someone” must then devise an extremely well-thought-out, detailed game plan for how to achieve these objectives. “Someone” must line the proposed route to achievement with clear, predetermined milestones by which those doing the achieving will be guided, and by which they can gauge progress. And correct course should uncertainty or deviation crop up along the way. And “someone” must at some point be able to ascertain that, yes, we are indeed realizing the purpose of the organization. Hoshin? MBO? I’d like to think that I’ve just outlined the very basics of a business system that both Deming and Drucker would find workable. I believe they would agree that the “someone” executing these activities is engaged in a practice called leadership, and that where all this essentially breaks down, in the real world, is in that very first step, clarity of purpose. Which is why finding and engaging the right leaders – whether you’re a Deming or Drucker fan at heart – is absolutely critical to the long-term success of any organization. So, in my mind, we should be spending a lot more time figuring out who’s going to lead, and the Hoshins and MBOs will get addressed in due time as the right leaders create the appropriate business systems. Otherwise, we’re really just sort of rolling the dice, no? So, according to this, the challenge of leadership and having the “clarity of purpose” is based on how one perceives the “system” to begin with and where he draws the boundaries of that system. The “components” that Deming refers to may be called the constituencies of that system, which is precisely the conversation the country is having at the moment with the Presidential election. Apart from the problems inherent in how one defines the “system” and thereby its purpose, a significant challenge, as I see it, is that the leadership itself has become one of the “components” or “constituencies”, or a proxy for one of the organic components, providing not only a conflict of interest but also presenting us with the, increasingly common and ridiculous proposition that we have to “second guess” the leadership’s decisions at every turn. That, coupled with the abundance of information but absence of knowledge, (also Deming), means that we are now hard pressed to in the first instance identify the correct leadership and second, to implicitly have confidence in that leadership and stick to our own “knitting”, which that leadership relies on to properly manage the “system”. By now, we know how to do pretty much everything and do it very well, deciding what we should be doing and thereby having the “clarity of purpose”, is where we seem to increasingly have difficulties. Well reasoned and stated Chris. Great point. I think part of the appeal of Drucker (read most of his books) was that a manager didn’t need to pay much attention to operations/production/implementation/technical matters and so could manage any industry, any business, in any place just by using primarily financial metrics (MBO came from someone else as did Management By Exception etc., forget who but also a management writer in the 1950’s…Odiorne?) That’s very flattering and reassuring to people majoring in management or getting an MBA, it certainly permeated the courses I took rather than stick to one industry and learn it deeply through many functions and many years to understand it and then presume to run it (even though far more great businesses were built and sustained by people with deep knowledge of their company and industry than novice “supermanagers” as Robert Heller memorably termed them. Deming had far more shop floor experience and with hundreds of manufacturers. Coming from the unusual Western Electric manufacturing arm of AT&T and the quality control challenges of making vacuum tubes (incredibly easy to screw up so drove quality control processes to a whole new level of sophistication) along with products assumed to work 50 years and function as cogs of a very complex system (long distance telelphony), Deming and Joseph Juran came out of a nearly unique environment (General Electric, Siemens, Radio Corporation of America, IBM, Grumman, Boeing, Douglas Aircraft, etc. being similar.) Jon Gertner’s new book on Bell Labs, “The Idea Factory”, has revealed Deming’s milieu just like the many books on General Motors and Austrian economics, Ludwig Von Mises also was a key mentor of Druckers as a young man at Vienna salon discussions along with even younger Henry Kissinger. A manager measured by financial metrics and just passing through to future jobs in completely different industries and companies has vastly more latitude to game the system for his immediate benefit and to sweep messy problems under the rug for his/her successor to confront in a year or two. That’s an unintended consequence of Drucker’s theory of management. Deming’s assumption that quality and product performance matters tremendously and takes time to accomplish, that the workforce has great value properly deployed and that high turnover is a very bad thing, that the work environment both in the company and in it’s supply chains matters more in ultimate success than hitting random financial targets to trigger management bonuses…it’s a vastly more humane system. Deming grew up in an abandoned railroard box car in tiny Powell, Wyoming rather than urban, cosmopolitan Vienna’s upper middle class. My grandmother’s siblings went to Vienna in the 1920’s while I live near Powell, WY…workforce in sparsely populated places has to be treated differently since they’re not easily replaced like in a city and getting things right in agriculture and very small businesses means life or death rather than a minor quibble about standards. Thanks for the historical details that explain where these two remarkable people came from. I have read several of Drucker’s books and HBR articles, and find that he is by far the better writer. In fact, he writes so well that he can persuade you of just about anything. I think of Drucker as the pied piper of American managers, wrapping ideas in such an attractive package that they all fell for them. My first boss in the US gave me a copy of The Effective Executive, which convinced me that I should record my professional activities minute by minute, so that I could manage what I spent my time on and free up substantial blocks to work on important stuff. It sounded great. I kept it up for one week, and never met since anyone doing it routinely. In The Practice of Management, Drucker discusses “Management by Objectives” but does not use the acronym MBO. According to my sources, the transformation of Drucker’s ideas into a consulting practice was the work of disciples, but I don’t think it absolves Drucker from authorship of MBO. I am puzzled at your statement that Drucker ghostwrote Sloan’s My Years with General Motors, My copy of Sloan’s book has an introduction by Drucker, which describes it as a rebuttal to his own Concept of the Corporation. My understanding was also that Sloan came from DuPont, rather than small business, and that it was there that he had worked out his system of autonomous divisions and financial controls. Deming’s Western Electric experience was in the high-tech of the 1920s. I think it is no coincidence that the industry where statistical methods for quality improvement still rule, through Six Sigma, its descendant in today’s semiconductor and advanced electronics. These are industries where, if your processes are mature, your product is obsolete. This characteristic makes process capability the number one quality problem, and therefore puts front and center the statistical methods to help you improve it. In Out of the Crisis, almost all illustrations are SPC control charts, and Deming obviously saw statistics as essential to the successes he had seen in Japan. On this point, Shigeo Shingo disagrees. In Zero Quality Control, he writes “It took me 26 years to free myself completely from the spell of inductive statistics,” by which he meant SQC and SPC. I trace this disagreement to different industrial experiences: machining and mechanical assembly for Shingo, versus electronics for Deming. Drucker does write extremely well, he’d clearly be a lot more fun to have wide-ranging discussions with while Deming’s the consultant I’d hire to get things working better. I read in several places, Drucker as well as others, that he “organized and edited” Sloan’s book and conducted a great many interviews, went through the corporate paper records, etc. and at least deserves co-author status…but the book reads like Drucker far more than Sloan and was his first book (a best-seller and management classic) and the first book has a lot of influence in the author’s thinking I’ve noticed. Sloan was an MIT Engineering grad (hence his alma mater’s Sloan School of Management) and with his father had bought a ball bearing factory in Detroit that was supplying Ransom Olds/Oldsmobile, Henry Leland/Cadillac, and Buick when Durant came up with the idea of merging a bunch of successful car companies into a really big one (“synergy” to boost the market value of the new whole) and drew Sloan into trading his company for equity in the new General Motors. When it ran out of operating cash about 2 years after formation and Durant was kicked out, the board of folks like Sloan who’d traded their companies for equity got Pierre S. DuPont, CEO of DuPont to come in and turn things around along with bringing in cash/credit/and operating experience. Sloan became DuPont’s deputy and gradually succeeded him as DuPont returned to the chemical company and a leading role in overturning Prohibition. So DuPont’s methods, already a century-plus old company with the accounting controls that commodity chemicals production teaches you, came in from the top. Interesting that Shigeo Shingo disagrees with Deming on that, Shingo has as many practical insights and the difference in experience makes sense. In Gertner’s book on Bell Labs/Western Electric/AT&T where Deming is I think until he’s sent out to a wide range of factories by the War Production Board (along with Joe Juran, Donald Laird and others) during WWII to improve quality. Bell Labs was also developing solid-state electronics, transistors, semi-conductors, computing technologies, etc. so Deming came out of far more of an advanced electronics milieu than I’d ever realized. Thanks for the details about Sloan’s background, and I just realized that he explains them himself in Chapter 2 of My Years with General Motors. I am a bit confused, on the other hand, by what you are saying about the books. Drucker did interviews and other research, with Sloan’s blessing, to prepare what I believe was his first book, Concept of the Corporation, in 1946. My Years with General Motors is Sloan’s memoirs and came out in 1963, by which time Drucker had several books under his belt. Shingo’s disagreement with Deming is not about gauges and measurement tools, but about the relevance of statistical methods. In Deming’s world, achieving process capability is the central issue; in Shingo’s world, process capability is a given, and quality problems are due to discrete events like a tool breaking or human error. Hence the emphasis on rapid problem detection and mistake-proofing. I believe that the fundamental basis of Deming’s and Shingo’s disagreement is the former’s adherence to “normal causes vs. special causes” of variation while the latter treats all causes of variation the same, thus squandering resources on diminishing returns, in trying to expunge all causes of variation rather than working on increasing the process capability itself. Again, for the reasons already stated, Deming attached statistical significance to causes rather than simply noting and going after their mere occurrence. At least, that’s how I’ve interpreted their difference. This is not a private conversation, and your input is most welcome. What I am about to say is my own point of view. I am not putting words into the mouths of people who died 20 years ago. I wrote a paper on this 10 years ago, called When to Use Statistics, One-Piece Flow, or Mistake-Proofing to Improve Quality. I think the issue is not one of statistical correctness or economic value but of technical relevance depending on context. In semiconductors, lack of process capability is the main cause of defects; in mechanical manufacturing, it just isn’t. Therefore, if you want to improve quality in mechanical manufacturing, you are wasting your time by using the statistical tools. The statistical tools will help you get from 30% defective to 3%, but not from 0.1% to 1 ppm. This is the range where other tools, particularly mistake-proofing, are effective. Should you want to go to 1 ppm? That is a different question. Very interesting conversation. Pretty good descriptions of appropriate tool usage SPC being one of the tools. I’m surprised at the % split you suggest Michel. I’ve always looked at the classic lean tools mistake proofing, standard work, etc. as the appropriate tools to use to go from 30% to less than 5% problems and the statistical analysis to do a deep dive, narrow focus. So statistics would seem to be the better way to go from 1% to 1ppm. Why do you think otherwise Michel. I’m asking to better understand, I’m not in disagreement, I simply have not looked at it like that. In semiconductors, you start high volume production with yields of barely 10%, which means that you scrap 90% of the chips you set out to make. Then it’s a race to enhance the yield by any means necessary, and it includes statistically designed experiments. This industry is the biggest user of statistical software. In auto parts, you have rates of defectives in the low ppms, achieved through one-piece flow, go/no-go gauges and mistake-proofing. In this industry, you have massive plants with world-class quality and without a single engineer trained in statistical tools. More generally, if you have process capability issues, you have to resolve them before you can even set up a working flow line, and that is where the statistical tools help. Once you have a flow line, your focus shifts to rapid detection and rapid response to discrete malfunctions, and it takes you one order of magnitude farther in reducing defective rates. What is left then is human error, which you address by mistake-proofing. That’s an interesting point you mention regarding the difference between Deming and Drucker on Management By Objective. While I cannot deny Deming is right, considering all the negative implications sometimes abstract or esoteric figures could have, I cannot also deny that quantitative objectives are required. Indeed, most businesses, at one point in their development, require external financial resources. Consequently, investors/shareholders need to know their return for such investment. The company’s CEO can share the same philosophical view exposed by Deming in his 14 Points however there is a time to give quantitative feedback to the mentionned investors/shareholders. Consequently, if one or several figures need to be reported (let’s take the example of ROI) then those figures need to be strictly monitored by the said CEO since he has a legal (not to say moral) obligation versus lenders. The cascading effect will have for consequence to bring down (and eventlually split) this main figure (e.g. the ROI) into its impacting variables (where quantitavive analysis will be prominent). This is exactly what is described in Strategy & Structure from Alfred Chandler (especially with Du Pont) and in Corporate Strategy from Igor Ansoff. Please note I do not say this is the sole and unique way to look at thing (for example using the famous Du Pont analysis) and more or less recent publications (e.g. Donald Wheeler in “Understand Variation” or more recently Forrect Breyfogle in “The Integrated Enterprise Excellence System”) demonstrated that while keeping a more or less MBO the impact of variation need to be considered. Moreover, as this was mentionned lately, other intangible variables need to be monitored. So basically, I fully agree with all what has been mentionned but investors do not really care about SPC nor Hoshin Planning, they want their return on investment. So far, in am really sorry to say that, quality people are living too much in their own world and this for a main reason: education does not promote enough the use of quality techniques/philosophies in the real world. As far as I am concerned I would believe quality (if we should still call it quality) need to be integrated in business management and when I say integrated I do not mean learned as a separate subject (the same way you could learn Marketing or Finance), it should be part of the basic BoK of any business courses (are you a manager if yuo cannot read financial statements and their implications?). Then It would become Management through Quality and not anymore Quality Management (which for me are two distinct things). I hope my little note did not break the interesting statistical discussion and I thank you again Michel for having bring this basic but too important subject on the table. I don’t think anybody here questions management’s accountability to investors, creditors, and other stakeholders. The issue is how you make this accountability cascade down into an organization. MBO and Hoshin Planning are just two ways to do it. You can add to that the Balanced Scorecard and Rank-and-Yank, and I am sure there are other more or less complete approaches. You need to think through not only how you evaluate collective and individual performance, but also how you communicate it and what decisions you base on it. I think we’re in agreement, based on how you have framed the issue, but there’s a salient difference as I see it. The variation that leads to quality issues can only be addressed with the statistical tools that Deming and of course Taguchi taught us. To say that mechanical manufacturing has little use/benefit from these tools really depends on what you call manufacturing. There are no one piece flow auto parts manufacturing processes-lines while there are many one piece flow assembly auto parts assembly lines… crankshafts are forged, ground, heat treated, finished…. etc. in batches and although a particular machine or set-up may be processing a single piece, as you know, there are multiple machines-setups doing the same operation simultaneously and sequentially, and all have to meet the same specification/tolerance and of course Taguchi tells us that’s not good enough… as we have to hit the “nominal” value, not just be within spec if we want to really minimize variation. All manufacturing parameters; temperatures, speeds, feeds, tooling life, etc. etc. are the target of SPC tools and this is what Deming was referring to, again in my understanding. That’s how the variation that leads to poor quality is minimized and of course it all depends on the upstream steps which design and specify those parameters to begin with. For example, the grinding of an OD of a shaft and the ID of a receiving piece, (say a bearing). If these numbers are consistently “hit” to the nominal specification with a tight distribution, then the downstream step of, say, a human assembling these two parts is a more robust process with minimized human caused variation requiring additional mistake proofing, training and/or increasingly complex specialized tooling to assure that he doesn’t damage the parts during the assembly operation or even worse, achieving assembly and marginally passing a dynamic test downstream…. yet being a lower quality assembly falling on the lower end of life in the field. These are all attributes that can only be analyzed and captured with statistical tools; that most engineers on these assembly lines don’t understand or know that, is not very relevant as that’s all been “canned” for them in their Go-No Go gauges, Reference Charts and Templates that have been developed by those that do, up stream. . I agree with your other points as far as the assembly operations go, as by that point, the human operator can only “degrade” the quality level and has no ability to improve it, as his variation is the most difficult to control, while still being able to be characterized with the statistical tools. There are machining cells in the auto parts industry that integrate multiple operations in one-piece flow, sometimes even including heat treatment by induction hardening. This industry enjoys the results of 200 years of development that have reduced variability in most of its processes to the point where it is not an issue. As a consequence, you do have plants with 2000+ employees making top quality auto parts at takt times of 20 to 30 seconds without a single employee trained in statistics. You still have double-digit failure rates during new product introduction in processes like diecasting. In principle, statistical tools could help stabilize them faster, but they do without them. Went back to your original post Michel to reorient. And shifting the focus slightly from Deming vs. Drucker but staying with metrics as a theme. Both Deming and Russ Ackoff liked to point out that every system, every process is connected to other systems/processes. Nothing operates totally independently. People involved in continuous improvement efforts frequently whine that they do not receive sufficient management support for improvement endeavors and they implore managers/leaders to come spend more time supporting improvement activities. Sometimes they do, but this is not the most effective way to engage leadership. Leadership is responsible for running the business in the most effective way for a variety of key stakeholders. When they get pulled from that activity to support an improvement program, those sidebar actions may or may not be linked to important actions for optimizing the overall organization. Motorola is a classic example of companies that operate this way. So management supports improvement as a sidelines activity and then they go back to managing the business….typically in a similar fashion to the same way they always managed the business. Leadership has two critical responsibilities. First they need to understand value from an external customer perspective. Not all customers are created equal. I’m a believer in the 80/20 Rule (Pareto) that typically 20% of customers (might be specific companies, demographic groups or some other common link) generate 80% of profits for many organizations. Unfortunately the strategies used by most organizations are quite mediocre (similar to the effectiveness of most improvement programs) – reference Rumelt’s “Good strategies/Bad strategies” text. Very often the business strategies are goals in disguise or simply a continuation of what was done last year….a little bit better. An organization should have some metrics that provide rapid feedback on strategic effectiveness. What can quickly be learned to revise the original plan and to create a true differentiation in the market place? Most improvement programs primarily focus on reducing waste, rather than the perspective of increasing value. The value focus will better align an organization with customer needs. There is very little discussion by improvement people of the significant strategic decisions made by companies like Toyota. Launching Lexus in 1989 is what moved Toyota’s profitability to new heights during the 1990s. The second area of responsibility is engaging the people who work for the organization. Most companies are not terrible places they work, they are Ok. Organizations that are highly effective at improving are typically much better at engaging the passions of people who work for the company (Toyota, Autoliv, OC Tanner, ThedaCare, W.L. Gore….). Most companies say, “Our people are important!” But how many truly measure their effectiveness at creating an environment where their people can do the best job possible….unencumbered by oppressive (over) control? And then there is the metric system itself. In most organizations they primarily focus on functional department performance (which is much easier to measure) rather than cross-functional performance. There is an unspoken belief that somehow optimizing the various pieces of the process with do the same for the process as a whole. Obviously a misguided belief. So developing metrics that look at overall performance can provide new insights, especially when organizations switch from lagging to leading indicators. Drucker was correct in his assessment that ‘what gets measured, is what gets done.’ Most organizations could do much better with their metric systems….but they don’t. But the changes needed bump up against traditional practices. So not very many venture there. You write that the leadership’s responsibilities are (1) “to understand value from an external customer perspective,” and (2) to engage people. It seems to me that you are leaving a few things out. You see very concerned about suboptimization. Avoiding it is the point of focusing on waste. If you eliminate waste in one area, you will make it perform better and you will make nothing else worse, resulting in an improvement for the organization as a whole. And a list like Ohno’s helps you recognize it when you see it. “What gets measured gets done” is one of those quotes that you can’t find a source for. It is attributed to Drucker, but I can’t find when or where he is supposed to have said it. Do you know? Regardless, I find it simplistic. In principle, you can measure anything, but there are many things you have to do, for which it is too much trouble. If you wanted to, you could do an economic analysis of every mistake-proofing device, complete with a cash flow schedule, breakeven time, internal rate of return, etc. It is just not worth it. You are better off just implementing it, and measuring only the aggregate impact on quality of the 100 mistake-proofing devices you implement. One should never just react to a number. You cite several appropriate examples where knowledge about more than the number is important. This was one of Deming’s key points about knowledge. And I absolutely left a whole lot-o-stuff out with saying leadership is responsible for two things. Those two items in my mind are critical because leaders often do not give sufficient critical thought to those topics. I’m also not really sure who made the ….what’s measured quote…but it does seem to work that way in many places. I’m focusing more on value creation rather than waste elimination, simply because creating value is harder to do. I can make the same argument that by focusing on value creation, much waste will be eliminated. It is simply the other perspective if you will. I take this perspective for one reason. Accurate assessment of value creation will result in a meaningful benefit to the organization. Much waste is simply not important, or at least not as important as getting the value proposition aligned and correct. I’m not arguing against waste elimination. Toyota had 40 years to perfect its quality processes before global organizations began to emulate it. Companies do not have the luxury of that much time today. They do want to create an environment where waste gets easier and easier to see, but that by itself is unlikely to change the organization’s competitive position unless they get their value creation engine aligned. Most companies implement improvement actions, pretty much the same was as most other companies. So everyone in an industry might get better, but only a handful will realize a competitive differentiation. After Toyota….the only other auto company to radically alter its competitive position is Hyundai. Even though all automakers have eliminated a lot-o-waste and manufacture much better products today. VW and Ford might be poised to do something, but it hasn’t happened yet. I find a concept like value creation abstract, high-level, and subject to conflicting interpretations. Waste, by contrast, is easy to understand, unambiguous, and actionable. I see focus on value creation as one more avatar of the market focus that American business schools have been teaching forever. What is original about Lean is that it makes you worry not just about customers but about internal operations and suppliers as well. It is not just about focusing on what customers are willing to pay for but about building a championship team that can compete and win in a market. As I understand the Nissan story, Ghosn focused on two issues at Nissan: product design and the supply chain. Not only did Nissan lack attractive products, but it was being gouged by suppliers who were taking advantage of long-term relationships. He didn’t focus on manufacturing because it was already a strength. I am not sure I understand your comment about VW, which I perceive as having come from behind in the past 10 years to become a contender for the top spot in the industry. All three of the examples you list Michel, are “externalities” that have nothing to do with the manufacturing process and its basic requirement for metrics and statistical analysis. 1. How much WIP? and how do we do that without disrupting the whole process? maybe it’s best to not build any WIP but shut down the line completely…. to make that determination we need metrics! 2. I’m not sure I understand that one..
3. So what if we lose a $100M customer? does it matter? to some companies’ strategic vision it may be a distraction not worth the bother…. we need metrics to make that determination. Otherwise, we’re managing by “feel”, which is fine, but how do you communicate the basis of that “feel”, to all the stake holders, internal and external? I just meant to give examples where measurement is in principle possible but more trouble than it’s worth. The decisions I am describing are not a matter of feel; they all have a rational basis that can be explained. I am not suggesting we don’t need metrics. We definitely need them. But we should not consider an activity as unnecessary just because its impact is difficult to quantify. If you only do what you know how to measure easily, things that matter to your business will not be done. That was my only point. And doing things that we can’t easily quantify but we know are of value is the essence of “value creation” which you and Michael are discussing. Of course, it can be easily argued that waste is easy to quantity but not necessarily in every case, something that should be eliminated since it’s elimination may not really create any/much value…. which I think was Michael’s point. I hear what you are saying about waste, yet when I look back at 30+ years of organizations implementing improvement programs (TQM, Re-engineering, lean, Six Sigma, etc.) I see very few organizations that actually changed their competitive position as an end result of implementing improvement projects. Waste inside any business is almost endless, you can always find it, but eliminating waste does not = necessarily increasing market share or increasing value to customers. I’m focused on the value part for exactly the reasons you say it is a problem (value creation abstract, high-level, and subject to conflicting interpretations…). This needs to be looked at from the perspective of a sense of balance. Right now….organizations heavily emphasize eliminating waste. Motorola reported Billions in savings from improvement projects…but they were a competitive disaster….with periodic moments of brilliance. There is insufficient focus on value creation and effective, meaningful business strategies. You are correct “value” to customers is very, very loose. So are the strategic directions in most organizations. This example is extreme….but if one does a better and better job of manufacturing buggy whips….that will not change the ultimate fact that customers ultimately don’t give a hoot what you do. While commodity components and commodity consumer products will ultimately go to the lowest cost producing country (or at least a lower costs) we have also lost much higher value adding manufacturing capability that could have been saved by a more enlightened leadership team. Innovation over a ten year period will typically suffer when application knowledge is moved elsewhere. We have seen this in the machine tool industry and many others. Unenlightened CEOs with a short term focused have made very poor decisions for the long term health of many organizations. A better understanding of value creation is needed exactly for the reasons you site. Today it is ambiguous…but it does not have to be that way. Chris…your last point is what I’m stressing. Ghosn did focus on the two categories you suggest. Their suppliers were actively screwing them. He also did a much better job of opening the innovation flood gates for younger people as he dismantled the seniority system in leadership. They actually had six major drivers in their 1990 turnaround, I have a one page overview of the strategic deployment…if anyone has an interest send me a note – it is in our book. Another Ghosn statement was, “You cannot cost save your way to greatness.” At some point you need to grow, and that requires an accurate assessment of value to customers. Organizations typically do an Ok job of this, they are not a disaster…but it is an underutilized perspective. Value is typically defined from an internal perspective…not external. VW from my perspective has simply come back from a near death experience, they have one or two hot cars. Chrysler does the same thing periodically. I don’t think….but have not checked the numbers – that VWs market share is significantly greater than its historical highs. I could be wrong on this. But I do agree VW is doing some cool things and is poised for a major breakout. Having said this….I agree ‘waste elimination’ is very important you simply should not put all of your eggs in that one basket. And I don’t, for one second, suggest that customers should be ignored… I think we are in agreement on the need for balance. And Lean is a business strategy for growth, not a cost saving program. Lean does not belong in a list with TQM, Re-engineering, or Six Sigma, which do not have the same scope. If you made a list of the areas of a business affected by TQM, Re-engineering, or Six Sigma, they would all be small subsets of the list for Lean. TQM is an ineffective and discredited watering down of the Japanese version of TQC, which had an impact in Japan but had run its course by 1975. By this I mean that its contributions were integrated in normal business practice and you no longer had major companies undertaking the implementation of TQC. TQM failed because it was centered on activities and not results, with the consequence that you could receive the Macolm Baldridge award while being notorious for bad quality. The ideas in Re-engineering the Corporation seem borrowed from Lean and from the structured analysis approach to software development. They were simplistic, in that not every activity of a business neatly fits the process concept, and they included no consideration on what to do with people displaced by their implementation, an omission that I think is the main reason it failed. Six Sigma, at Motorola, was a welcome modernization of SPC for process capability improvement in high technology. Taking it global cosmic and presenting it as a universally valuable business philosophy was a fatal mistake. Because Lean is drawn from the practices of one spectacularly successful company, it includes approaches to production, logistics, maintenance, quality, human resources, product development, etc. Outside of car and auto parts manufacturing, of course, Toyota’s tools rarely apply verbatim. The challenge of a broader implementation is the adaptation of the approach to different contexts. Not many companies and consultants are up to it, with the result that most programs are L.A.M.E. rather than Lean. Returning to Deming, in Out of the Crisis, he complains about “hacks” teaching mistakes about his ideas to companies and hurting their reputation. The same can be said about Lean. But I see from your bio that you started working with Deming himself about 1980, and maybe you can comment on that. My only retort…would be along the lines of your LAME comment. Which is the model most organizations follow in implementing lean….it’s much closer to your description of TQM rather than a business growth model. For better or worse the language I’m using is an attempt to get people to focus on business growth. I’m sure there are subtle differences in what we are stating…but I suspect we are mostly thinking along the same lines. 3. Key metrics….again this is part of the conversation in this thread. At a leadership level, metrics are typically lagging and functionally focused. Not cross functional. 4. Process thinking…this is an ingredient because most leaders are NOT process thinkers. I’m using the word ala Deming. 5. A leadership mindset to manage improvement using the above four levers. If leaders did this….lean thinking would be a natural by-product of the process. I would strongly argue that if more leadership teams did the above effectively (rather than in a an average way – aka like most other companies) their global competitive position would improve, they would be a better place to work and their shareholders would benefit. I see the above as a more concrete way to reference the overall business, rather than just an emphasis on ‘waste’ reduction. I’d guess in essence you would agree Michel, Chris, etc. But you would probably package the concept somewhat differently. Our goals though are similar in what we would like to see more companies accomplish. Following the same line of thinking, I put Lean on that same list in an article I wrote in 2005, for the same reason….. namely all those approaches including Lean, are “LAME” in that they lack innovation and are simply looking to emulate/copy someone else’s methods. That’s why they all fail! At the risk of falling into Deming’s criticism of “servo-gadgets”, here’s the article and implicitly focused on growth and new value stream creation, albeit from a different perspective. I only wish I could spend time with Deming now. As now I could really learn something. In the 1980s my little brain was not big enough to hold (understand, grasp) everything he was trying to teach. As a matter of fact….I truly did not understand most of what he was trying to teach, at that time. But I knew there was something good there. Guess much of my life has been spent trying to figure it out. I like the twist mentioned earlier in these discussions about Deming’s perspective as an employee of Western Electric (the Intel of the day) vs. someone working in the automotive industry with longer lasting processes. It is an interesting perspective that could result in potentially differing views (neither completely right or completely wrong – situation dependent). I do find myself going back to many of his principles. He was quite holistic and very thorough. Good point Michel! Even with the gratitude on all written books and quality lessons of Prof. Deming, I feel more comfortable on following the directions given on “MBO” and working with numerical goals and well designed “Meritocracy”. I think it is more productive to mix both cultures!!! 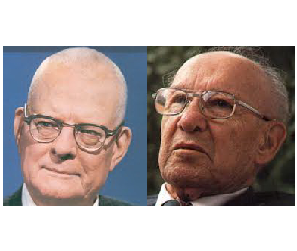 Deming & Drucker! I would appreciate to read more comments!! Am I alone in this opinion?! Thanks for sharing your insight, Michel, that managing to the numbers (aka MBO) generally leads to gaming the metrics. That is my experience as well. It is not productive. I now know what MBO is and where it came from… which nobody in the organisation I worked for could explain to me when I questioned what it means when my inexperienced manager was performing my review based on this idea… LOL! Michel, good overview. I think Deming was mostly right especially since many goals or targets focus on individual departments and will surely lead to sub-optimization. Leadership and better understanding of systems can be much more powerful. I’ve always enjoyed the views of Professor H. Thomas Johnson in his book ‘Profit Beyond Measure – Extraordinary Results through Attention to Work and People’. I’ve seen too many metrics that drive incorrect, counterproductive behavior. Explains why I was noticing a distinct lack of accountabiliy on the part of some managers in the organisation I was an employee. Nobody would take accountability for failures in processes as different departments were pursuing their own objectives rather than working in harmony with other departments. Yet managers were quick to take credit for any successes their departments were able to show or downplay successes that they were not involved with so could not take credit for as they were maneuvering their own career objectives. Druckers idea to break up responsibility maybe the easiest way for Senior management to achieve the corporate objective does not guarantee effective and efficient use of resources at all levels and departments of an organisation. Better to encourage harmony between departments than competition for resources IMHO. Hmmm… the frustrations of being an employee at a global corporate organisation and I am grateful for the experience and what I learned there. Dr. Thomas H. Agrait,I.E.- C.S.S.B.B. There is a distinction between disagreeing with someone’s ideas and attacking him. It is possible that Deming or anyone for that matter can admire and respect the intellect and work of Drucker while disagreeing with his conclusions. Interesting article. It is always great to be reminded of Deming and in particular Deming;s 14 points. Of course, it’s not a personal attack. Deming does not even name Drucker, but he explicitly recommends eliminating what Drucker was recommending. It strikes me as more than just a disagreement. Interesting. I respect both Deming and Drucker. Let me know what you think of this objective and metric….is it Demingess or Druckeress? Objective: The trend of your daily productivity needs to be positive. Metric: The slope of the trend. Data used: Daily productivity (however it is measured). Unfortunately, neither is alive to answer your question. I think Deming would check the validity of the productivity metric, and analyze the data to tell meaningless fluctuations from real changes. As far as I can tell, these are not issues Drucker ever concerned himself with. It is of course entirely possible for the two strategies to be identical. A manager in an MBO organization could choose Deming’s 14 points as the objective to be implemented. Or perhaps Deming’s 14 points are the guidelines that Drucker needed as the method for executives to choose and implement a suitable objective. How could a manager in an MBO organization choose to implement Deming’s 14 points as an objective when point 11 (b) is to eliminate management by objectives? Whether personal or ideological, the “attack” is real and substantial Michel. What’s more important, in my observation, is to understand the extent to which these two differently articulated management approaches succeeded in each of their applications and then to understand why they succeeded, if at all. So, where are we now? which, if either, approach makes sense in a WTO, multi-polar and increasingly connected World? or, do we need a new paradigm? Drucker’s formulation of MBO is from 1954’s The Practice of Management, and the post-war economic boom was well underway by then. I am preparing a new post about all of Deming’s 14 points. My take on them is that manufacturing professionals should know them, but that they do not provide unambiguous, complete and actionable guidelines usable as a basis for strategy today. Your point is well taken Michel. The 14 points are a Manifesto, not a “how to manual” although he gives many examples and implicit in all of them is that he is talking to the management/leadership of the organization, not the workers. The “ambiguity” you reference, in my estimation, is there because even the 14 points are no substitute for leadership which must determine the proper course at a particular time, under the particular circumstances of a particular organization. Great that a few more voices entered the dialog. To your last point Chris….I truly don’t think it matters? if you look at intent vs. reality. There is a Gap. Certainly the original proponents of MBO did not intend to sub-optimize business performance in any way. It simply gets executed that way. I disagree with Michel’s point about TQM or any of the other myriad of improvement programs that have come and gone over the last 30 years. I could take TQM defined as, “Better Meet Customer Requirements” and do the exact same things people do using lean. You could do the same with Re-engineering. Admittedly each new improvement program that has risen to the top in terms of popularity does offer a new insight, a new perspective. TQM = Meet Customer Requirements; Value Engineering = Eliminate Non-value to customers (unfortunately this primarily looked at products, not business processes….but a person could use the same thinking if they elected to look at a business process); Re-Engineering = Design your processes like an engineer; Lean = Eliminate Waste; Advanced Lean = Improve Flow; Six Sigma = Eliminate Defects; Advanced Six Sigma = Reduce spread of Variation, etc. You could take anyone of these and run with it and do the exact same things espoused by the other methodologies. Unfortunately, when the methodology reaches the ‘real world.’ People do not want to think about it that deeply. They look for the programmatic ‘quick’ fix. Thus most improvement programs do result in improvement…but alas they do NOT RESULT in transformation. 70% of the basic improvement tool sets are common to all of these methodologies and their roots are based on 100 years of industrial engineering. Execution is the problem, not the methodology. Thus I’m on a mission to refocus these things on the business…not on the methodology. I don’t think I’m making a lot of headway doing this…but alas…in the time I have left to work and do public speaking…that is my mission. So the problem is not Deming vs. Drucker. It’s how people do Drucker and unfortunately how few give very much thought to the brilliant ideas/concepts fostered by Deming. MBO is fine…so long as it is not focused on optimizing pieces of the business and if it would take into account a process perspective. It does not typically get done that way. As an aside…I do believe George Odiorne was the original proponent of MBO as was mentioned earlier. I no longer have the book, but years ago had a copy of Management By Objectives (1970, Odiorne). Perhaps Drucker wrote about this sooner…I don’t know. He was a proponent of the concept. I think we should go back at least 100 years rather just 30. There are good ideas about how to work as individuals and organizations, and not-so-good ideas. And there are ideas that work great in a given industry at a given time and not so great elsewhere at other times. They also change as they migrate from a theory formulated by one author to a consulting practice with thousands of experts helping companies implement it. In the consulting world, “TQM,” “Six Sigma,” or “Lean” are less theories and approaches than marketing labels. When a new term gains traction, many consultants jump on the bandwagon and attach it to whatever it is they were doing. After a few years, what is sold under a label has little to do with the original ideas that inspired it. People like Taylor, Frank and Lillian Gilbreth, Deming, Ishikawa, Ohno, Shingo, and others, all had different and contradictory ideas. It is what is stimulating and makes them worth reading. We should learn from these differences rather than gloss over them. It is the consulting world that reduces them to a boring, oecumenical, blended soup. Management by Objectives is major topic in Drucker’s 1954 book, The Practice of Management. That was 15 years before Odiorne’s book. I question the depth of investigation done with the last comments regarding consultants. Consultants are at a distinct disadvantage from the outset. They virtually never have the full buy-in of executive officers, nor the authority to implement strategic-wide initiatives. Of course there will be no comprehensive transition to TQM, Six-Sigma or Lean, however that is not possible anyway. Those concepts are an “idealization from the imagination” (Copyright 2012, KDB). Even a new start up has no hope of achieving the maximum of the concepts. The objective is measurable improvement using proven systems, hence the need to use the terms most identifiable by those without the wherewithal to conceive or implement them themselves. The terms have to used, the performance will not reach the idealized terms, and the consultants shall not be held accountable for doing more than the contract metric states. It’s the difference between books and implementation, thinking and doing. I am not sure what you mean. Could you elaborate and clarify? Your comment is about how consultants execute; mine was about marketing. I may sound cynical but, as a consultant myself for the past 25 years, I have earned my cynicism. Take the case of TPM. I heard through personal communication from a JMA consultant in Japan at the time that a group coined the term based on the need to provide some sort of service for Maintenance, before deciding what the content would be. It was like Hershey Hugs: Hershey’s marketing first came up with the name, based on Hershey’s Kisses, and then the company ran a contest among employees to come up with a product matching the name. Hershey Hugs are delicious, and TPM turned out to be a serious contribution to Maintenance, but both names started out as marketing labels. Hershey Hugs today taste the same as when they were introduced, at least as far as I can tell, but TPM has changed. In the process industry, it became the umbrella program for all improvement activities, including many not related to Maintenance, and consultants in the field readily admit that TPM as marketed in the food or the chemical industries has little to do with the original TPM. Similar stories could be told about other labels. If your clients want service Y and call it X, you call it X too. You don’t have a choice. And it does not make technical communications easy. My success as a consultant comes from a different point of view and marketing my services with the standardized terms that are corroborated by information the client could easily receive elsewhere. How would the client respond if they discover through a basic wiki search (or a previous client, or a book, or the wall street journal) that the terms the consultant uses with them are not the ones used throughout the trade for this service? I would not want to deal with that or it’s impact on my practice. If my clients want service Y and call it X (i.e., almost every client), I tell them the difference, I then tell them why it is called Y and not X, explaining how Y is the improved, outdated version of X, followed by supporting evidence. All of my clients come from referrals, so I then tell them that this is the method I used with the referrer. I also tell them that regardless of semantics of Y’s or X’s, I will hit these performance targets for the contract, just like I did with the other 260 contracts I have performed. This generally dispels any need for closing contracts by misusing terms. In the rare cases (There have been a few) where the client insists on using the wrong terms/wrong approach, I refer them to another consultant. I have been consulting only 15 years, so perhaps in 10 more I will see it differently. I applaud your integrity and hope you are able to keep working this way. Wow! Lots of great ideas here. Great post. While I think you have effectively highlighted the difference between Deming and MBO as practiced, I think it might be a little off the mark to position this as Deming versus Drucker. Drucker was certainly no fan of how his work was interpreted and applied including MBO. It may be a little like critiquing Deming for TQM or Six Sigma. In defining MBO, in the Practice of Management, Chapter 11, Drucker makes it clear he is NOT talking about managing by the numbers or numerical goals but rather, more broadly defined objectives to keep management from acting on the basis of ‘drives’ or ‘crises’. It is (almost eerily) an argument for Deming’s Point 1, Create constancy of purpose. While writing about the Deming/Drucker distinction in The Performance Improvement Toolkit, I was struck by how off the mark my understanding of Drucker was. After rereading The Practice of Management, I decided to reframe the discussion of Deming versus Drucker to Deming Philosophy versus MBO. As an aside, I find this useful from time to time in handling objections from executives who believe they’re operating in accordance with MBO as Drucker defined it. I have the Practice of Management on my iPad (so it’s easily searchable) and have been known to challenge people to show me where the man that defined MBO ever said things he is assumed to have said. Very effective. The issue, as I see it, is ridding management of what we now call MBO and replacing it with the Systems Thinking of Deming. MBO has become a part of what it means today to be a Professional Manager (to use Mintzberg’s term), taught in business schools and so forth. We need to get Real Managers, who understand and think in terms of systems and process complete with an understanding of variation. In this regard, a rather large technical paper; The Decline of Health Services in Alberta (http://www.converge-group.net/620/) may be of interest. It describes how non-Lean, MBO thinking and metrics has demolished health care management in Canada. Sorry for the length of the response. Stating that one should “eliminate production quotas, management by objective and any form of management by numbers”, seams in contradiction with the idea of kaizen (i,e, we can only improve what we measure). Even though I have my own interpretation of the statement, I’d like to read comments on this paradox. I would not associate with Kaizen a statement like “We can only improve what we measure.” It sounds more like Six Sigma talk. Kaizen includes many small improvements, for which an economic analysis would take longer than implementation. To apply mistake-proofing in an assembly line, for example, you make many small changes to many stations. You should be able to measure the aggregate impact of this effort on quality, but you would never get it done if you required an economic justification for each individual mistake-proofing device. To this day, the key reference on mistake-proofing is the big red Poka-Yoke book from Productivity Press, with its 240 examples. Each example has a before-and-after description of a process, showing what kind of mistake was prevented and how, but none of them includes any indication of how often these mistakes occurred, what their impact was, or of the cost of implementing the poka-yoke. On the other hand, on a whole production line, we know that mistake-proofing is what we need when most of our quality problems are due to human error, and benchmarks show that it is capable of taking the rate of defective production from 1000ppm to 15ppm. According to the Quality Gurus, 95% of the defects in organizational routines are attributed to top management decisions. Discuss the validity of this assertion using relevant examples? Ohide is a student in South Sudan, and his question sounds like a course assignment. But this kind of information may be difficult to find in South Sudan. Maybe we can collectively help him. Deming is talking about processes with a capital “P.” Earlier in his life he used to say, “85% of all performance problems are process problems, not people problems.” Toward the end of his life he was saying 95%. It is probably impossible to prove which number is right, and it really isn’t important. The intent of his message is the important component. 85% – 95% of all performance are management’s responsibility because management owns the systems that get used to run the business. So if there is an accountability problem, what are the processes for holding people accountable? If there is a true individual performance problem, what are the processes for dealing with the issue? If people are not capable of doing their jobs? What are the hiring processes, what are the training or job certification processes, etc.? All of which are owned by management (collectively). Hopefully that adds a little clarity. Best wishes on your improvement journey.